This is not a protest. It’s a celebration! Joey Veltkamp is unfolding one of the largest quilts I’ve seen him make, one that is meant to envelope not just one body but two. Its largest patches are made from a friend’s red plaid lumberjack flannel; one pocket prominently, lovingly, placed near the top of the blanket. “… this is for love letters,” Joey explains as he pats the pocket and flattens out the quilt. I nearly die with the sweetness, the sincerity of the remark, and the absolute romance of the thought that a quilt could be made to contain such a thing. It fits, to hear those words come from Veltkamp’s lips. After all, his entire body of work is a love letter. Even when the work is about mundane objects, Veltkamp is reaching out from the heart to express something tangible about the emotions we’re feeling. In the truest sense, he is drawing from a long history of art made from love and nurture, creating objects with beauty and meaning as well as function and memory. In 1987, a group of friends wanted to honor the multitude of deaths that AIDS had wreaked upon the gay community. Their response was to create a quilt memorializing the names of people who had died, and is known as The AIDS Memorial Quilt, founded by The NAMES Project Foundation. Born out of anguish, the NAMES Project has served as a monument to the catastrophic effect the disease had not only on an entire culture, but on individual lives. This project points at those lives and humanizes them. These were people, not numbers or statistics. The immediate personal impact of the disease was devastating to an entire culture. Through the act of sewing – a form of mending – and naming, the AIDS Memorial Quilt became an act of healing. The specter of the Memorial Quilt is real. Its purpose was to commemorate the ghosts of people we remember and heal those who remain. In 2011, Joey Veltkamp exhibited a collection of colorful, pinched clay ghost sculptures at SOIL Gallery in Seattle to document his own journey through sadness. Sweet, simple, and playful they were small protagonists in a story about grief without a name or a place. They served as symbols of people – friends, old celebrities, fictional characters – but over time they became friendly, warm, and comforting. It is from these that a new series emerged, a series of drawings Veltkamp made based on the shape, color, and repetition of form inspired by piles of blankets. Like ghosts, blankets are imbued with the presence of a person. Unlike ghosts, they don’t hold the shape of the person beneath them. Still, altered by our interaction, carrying our scent when we’re gone. Blankets and quilts hold us when others can’t. They keep us warm. Soft, cozy, and sometimes fluffy; they are in the truest sense of the word, “comforters”. 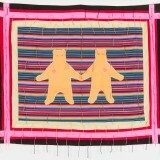 Joey Veltkamp is creating a series of quilts and flags where color forms stories of identity through symbolism. Common themes of alienation or weirdness emerge, for example, in the way he uses neon, giving us a visual clue that there is something happening or about to happen. This use of color is a marker of uncanny Pacific Northwest energy, a sign of something strange or supernatural. Veltkamp loves to touch on the bizarre nature and mythology of this rainy, dark, and mystical region – our penchant for vampires, serial killers, and long dark winters creates a sort of Norse-like feeling of weirdness and the supernatural. The Northwest, a historically transient location in the furthermost corner of the lower 48 States, is a home to misfits, weirdos, and outcasts. The flags feel celebratory but they are also a call to attention. They are evocative of banners carried by activists during a march, containing short but memorable words to carry home and not forget. But rather than protest, they serve as an homage to the heroes in his life, people who are in his words “folks who create space”. And in fact, while Veltkamp isn’t ordinarily identified as an activist artist, he has a history of doing just such a thing in his artistic practice: he creates space. Whether that’s been through his blog “Best Of”, using his studio residency at Seattle University for a series of workshops taught by artists in the Seattle community, or creating the Seattle Women’s Convention at the Hedreen Gallery (again, at Seattle University); this is precisely what Joey’s activism looks like. He clears the stage for others to speak, or just be. We expect artists to exist in a dynamic, rather than a static state. We expect them to respond to their environment and a constant stream of input and information. While some collectors or critics might fear a lack of consistency in the work, the continuity actually lies within the artist’s underlying philosophy. The artist him/her/self is the binding thread. Therefore consistency is an inevitability. Artists must allow themselves duality and contradiction – I am this, I am not this, I am these things. It speaks to their unspeakable compulsion to make things, whatever those things may be, whether tangible, idea-based versus object-based, curatorial, and so on. True to the content of love letters, Joey Veltkamp’s duality is sweet, nostalgic, and celebratory. Like a rush of blood to the head, we are drunk in color, joy, and happiness. Of course there is context, meaning, and a story Veltkamp wants to tell us, but he doesn’t tell it for us. His view is only a window into a world he is willing to share and we are allowed to move through it and place ourselves within it. He has created a space for us. Sharon Arnold is a Seattle-based artist, writer and curator. She is the founder/director of LxWxH gallery in Georgetown.